"Hey look - shooting stars!" Fox has released the full trailer for Blue Sky's latest animated sequel, Ice Age: Collision Course, continuing the adventures of Scrat the sabertooth squirrel as well as Sid, Manny and Diego. For those who want to understand how this movie starts, we posted the full Cosmic Scrat-tastrophe short online showing how Scrat causes an asteroid to fly towards Earth. This trailer replays most of that short and continues with a tiny bit of footage at the end. This is the fourth sequel in the Ice Age series that started out back in 2002, and I haven't watched a single one of these since then. If you're interested in more give this a look. The voice cast this time includes Nick Offerman, Simon Pegg & Melissa Rauch. Enjoy! Scrat journeys where no Ice Age character has gone before in Cosmic Scrat-tastrophe. The consequences of Scrat’s antics are always momentous, and this time he’s creating his own version of the Big Bang – and a cosmic "Scrat-tastrophe" that could have huge consequences for Ice Age herd… and the rest of the world. This animated short is showing in 2D and 3D exclusively in front of The Peanuts Movie, now playing in theaters. 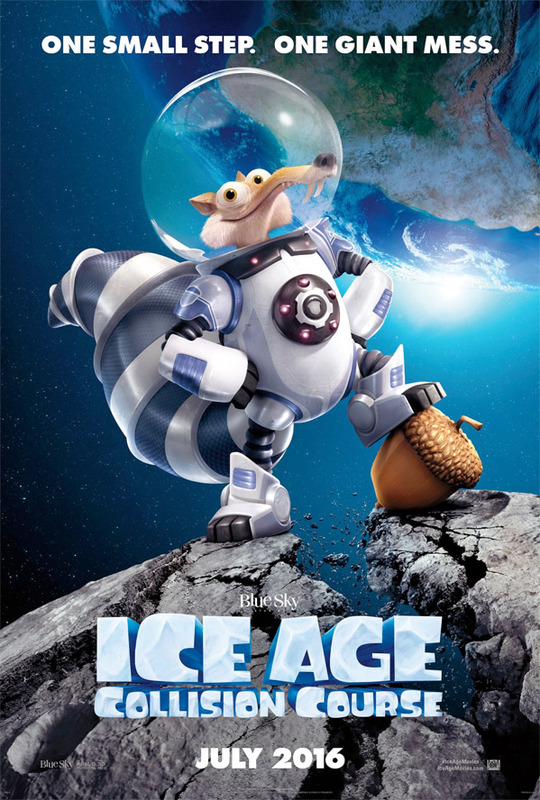 Scrat's epic pursuit of the elusive acorn catapults him into the universe where he accidentally sets off a series of cosmic events that transform and threaten the Ice Age World. To save themselves, Sid, Manny, Diego, and the rest of the herd must leave their home and embark on a quest full of comedy and adventure, traveling to exotic new lands and encountering a host of colorful new characters. In theaters July 22, 2016. You know they just did the Peanuts movie, right? That was amazing animation! Ok cool. But I completely agree. This series is getting stale. Their next two films are Ferdinand and then Anubis so I'm guessing you'll get your wish for some new IP.